Automated Guided Vehicles (AGV) are part of this rapid development. This case describes a how we met the wishes of an OEM AGV-manufacturer. 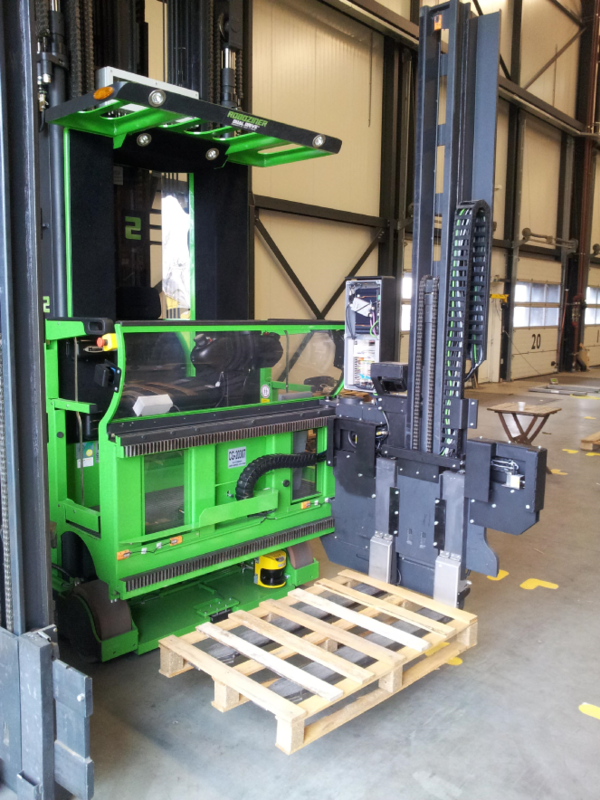 With high costs per m², most logistic centres use high-rise warehouses where forklifts are used to manipulate pallets. Obstacle detection – is a location truly available? We developed an automated pallet detection-system as an add-on feature. The AGV can autonomously detect whether or not a product is in reach and give feedback how to position the forklift correctly. This makes the lifting and moving of pallets safer. Another form of feedback is the verification that an assigned empty stock-position is really empty. Although ERP-systems give accurate information, the risk remains that a nearby pallet has a part protruding into the -theoretically- free zone. Thirdly the AGV detects obstacles on the floor and anticipates on these. For example by slowing down or stopping and call for assistance. The below movie demonstrates how this technology was used in the Roboziner developed by FROG AGV.